The YoY promotional index continues to track higher. The index was virtually identical to last year’s until Week 32. 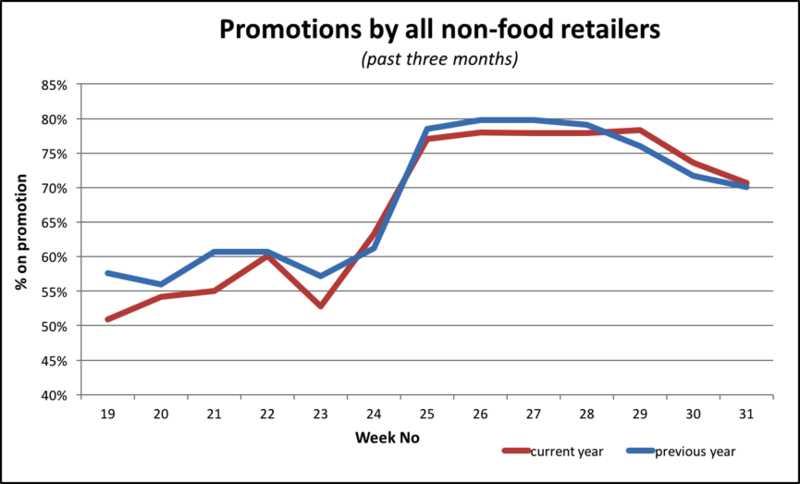 Our index of premium retailers’ promos has been markedly higher YoY for the past 8 weeks. Department stores have been driven up this week by JL and Fortnums both going back on sale after 4 and 6 weeks on full margin respectively. 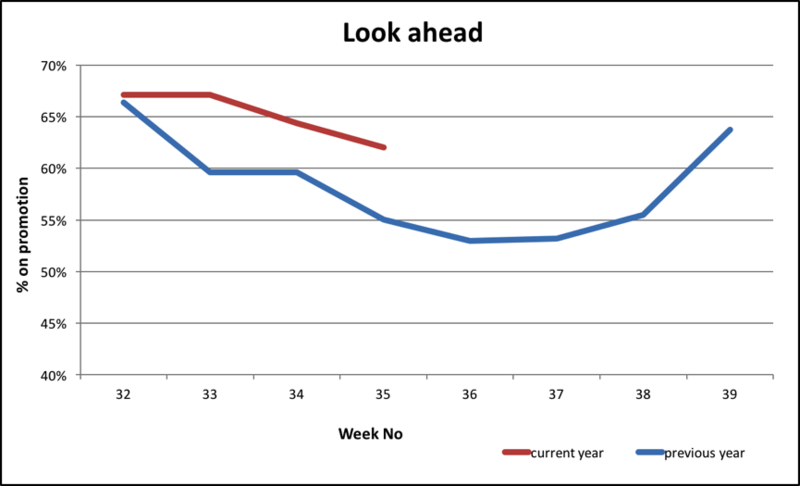 Last year’s fashion in index was below 50% on each of the past two weeks. This year’s are 61% and 58% respectively. 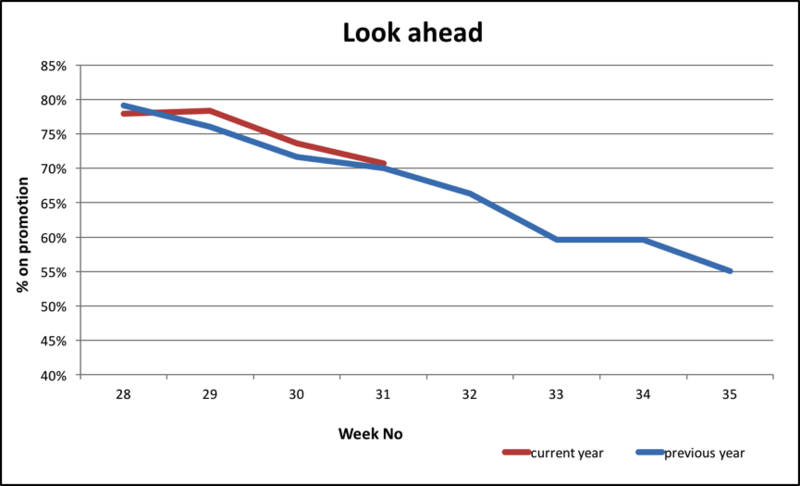 Soft demand in fashion particularly will make it difficult for retailers to return to full price over the coming weeks. According to the ONS, UK non-food retail sales by value are up 6% YoY in the 7 months to the end of July. The latest ONS data show that GDP growth more or less disappeared in Q2 2017. Confused? You should be. 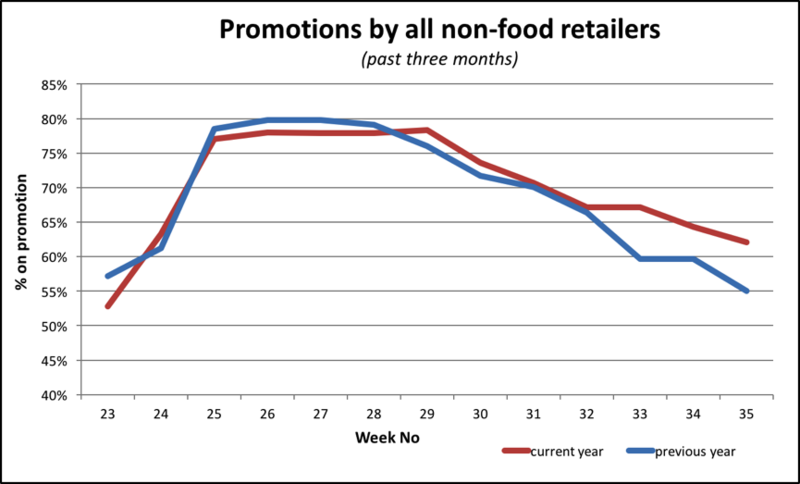 For around 12 months now, the ONS data have been totally unbelievable and downright misleading. Exactly why is difficult to fathom. Let’s take clothing as an example. In the ONS data clothing represent specialist retailers and sales by value are up just over 7%. Anecdotal evidence is totally different. My discussions with leadership teams across the industry, ONS data are simply not reconcilable with current trading. Nor are they with the promotional stance of the majority, clearly discounting by default rather than by design. Leadership teams tell me consistently that this is the toughest market they have seen. Underlying weakening consumer economics is the structural issue I have been banging on about for many years – oversupply. Far from contracting while online has raced, space has actually continued growing. The pincer movement of growing capacity and weakening demand means increasing pressure on margins. Some key milestones await. Quarter day end September will be a key moment when lots of retailers need to find lots of money to pay landlords. Then there is Black Friday, a performance-damaging event that remarkably few retailers have so far been strong enough to resist. 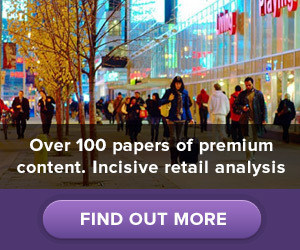 Then Christmas, previously the be-all-and-end-all for retail but progressively hit by Black Friday. The most heavily discounted retail year so far will not be rescued by an increasingly pressured consumer. Fashion is the major driver of this change. 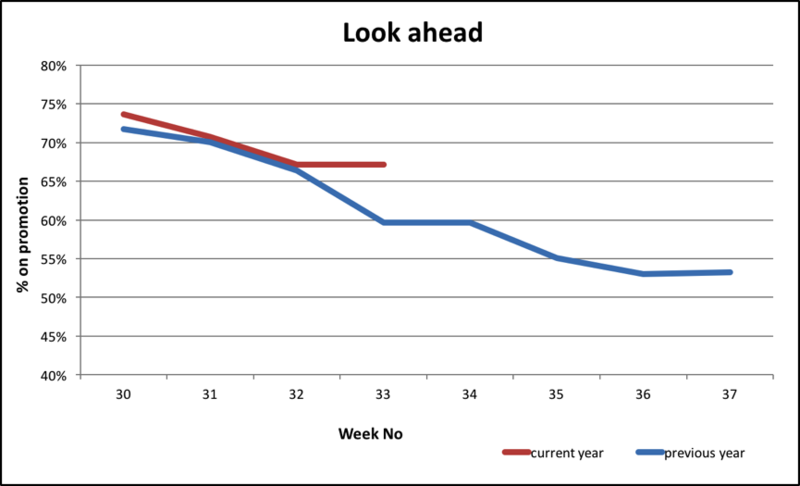 Last year, Week 33 saw a significant ending of Summer Sales, down to 58% from 65% the week before. This year, the steady return to full price seen recently came to an abrupt halt. This has not translated to related sectors. Department stores and footwear both continued to return to full price. Will the trend close the YoY gap next week? With demand fragile and consumer confidence brittle, extending sale periods may well become increasingly attractive. 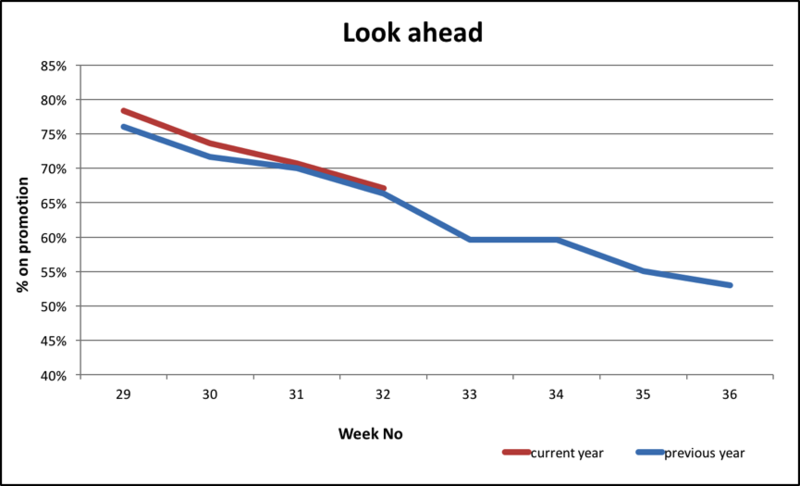 This week’s tracker is down to 67%, continuing to follow last year’s pattern with just 1% point difference. 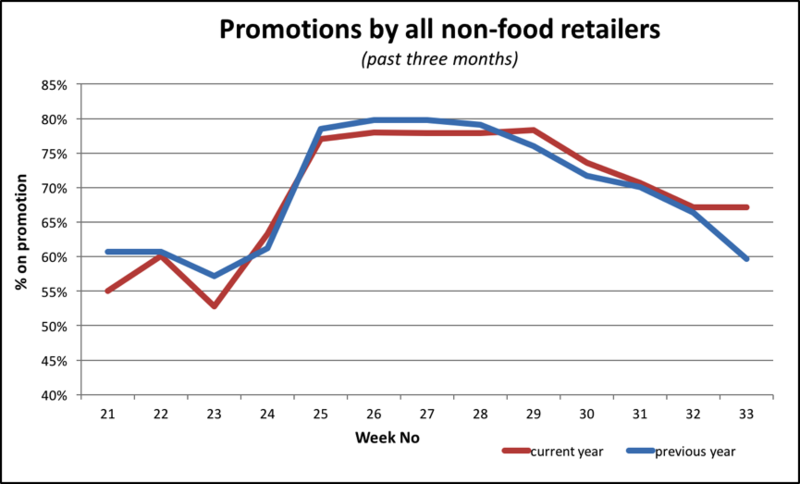 Despite the material price inflation being imported into the UK market, non-food retailers are mostly unable to kick the promotional habit. 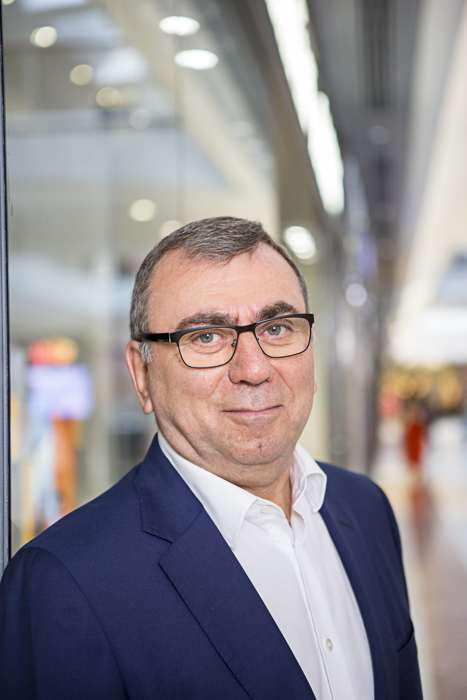 It’s worth underlining the fact that two thirds of all our non-food retailers are still on sale – only a tiny (less than 5%) are actually designed to be this promotional. Department stores, fashion and footwear all posted reduced promo indices this week. However, personal care and hard goods like electrical and DIY have all moved in the opposite direction. Many retailers are desperate to kick the discount habit. Very few have the will or brand strength to do so. 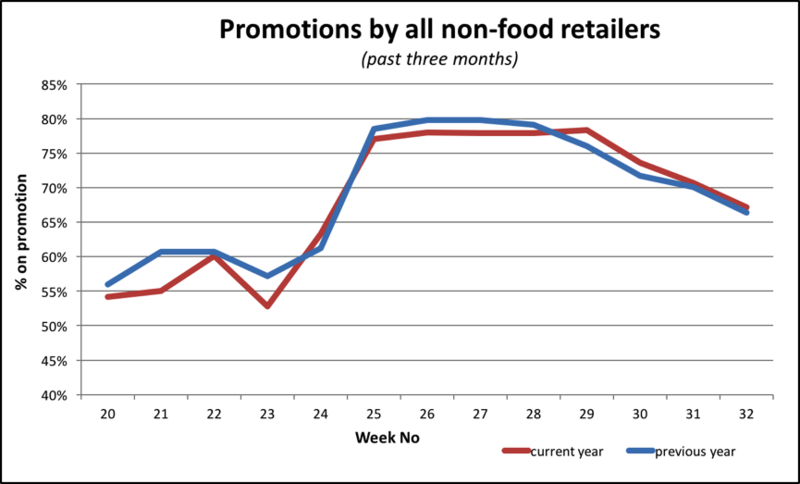 Our data reflect a market where the majority are prisoners of their promo stance 12 months ago. We see no prospect of material deviation this year from the pattern of 2016. Next’s price integrity remains rock solid. Summer Sale lasts 2 weeks – 29 and 30 every year.